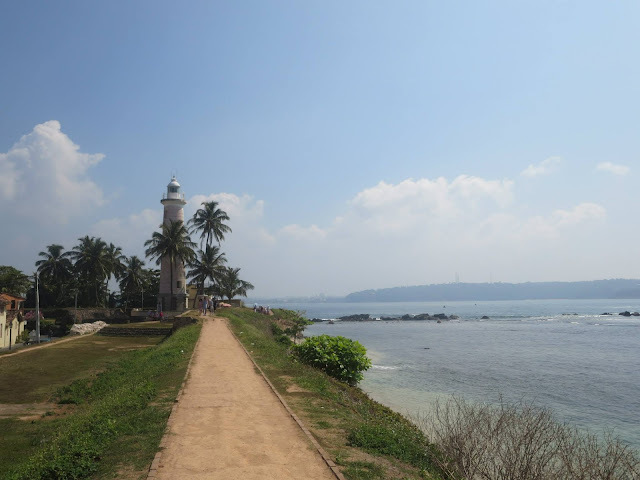 Since I was born, I have been visiting Galle Fort every four or five years. Despite the time between visits, the town remained relatively unchanged. I have fond memories of cycling down the dirt roads past the Dutch inspired homes filled with local families. 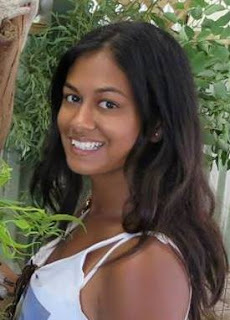 And even though I wasn’t from the town or even the country, it was not uncommon for me or one of my family members to get stopped on the street and asked if we were X’s daughter , Y’s sister or Z’s granddaughter (My grandmother, my aunty and her family live within the fort). My family runs a guest house (Beach Haven) and back when I was a child the majority of the guests were older tourists or medical students from abroad working in the local hospital. Now days, it’s a mixed assortment of tourists from all around the world. In the past few years, I have been lucky enough to have gone back for visits almost every year and I am always shocked by all the changes to the town. 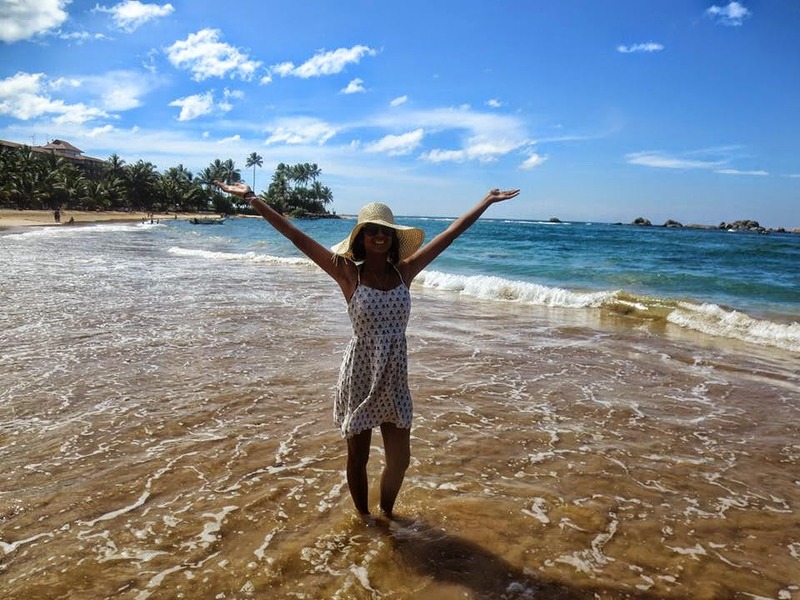 With the civil war ending in 2009, Sri Lanka jumped to the top of “must visit” travel destinations and Galle was certainly a must see in Sri Lanka. This boost in tourism has certainly impacted Galle. The dirt roads are now paved, the streets are filled with tourists and more and more local families are moving out and their homes are being turned into tourist shops, cafes or guests houses. Whether these changes are for the positive, you be the judge. And I suppose it depends on your travel preferences. Do you prefer a town untouched and under no influence from the western world (which may be harder and harder to find with globalisation)? Or do you prefer a town that caters to guests and tourists? If you prefer to get more of a local experience, then go for guest houses. That way you get a look into local family life and may even get a home cooked meal! I have been part of many family dinners and events at my grandmother’s house where guests have been invited to attend, an experience you wouldn’t get at a hotel. But if you prefer to have a bit more luxury then a hotel (e.g Amangalla) is your pick. Or if you are after dirt cheap and don’t mind sharing your room then more and more hostels are starting to open in the fort. Accommodation inside the Fort is not sparse, with the streets lined with offerings. This is quite a new structure, built no doubt to lure tourists into spending. There are a few shops, none of which I went in because they looked pricey (labels like Rolex clued me in) and aimed at richer tourists (i.e. not fresh uni grads like me). There are also a number of restaurants and a bar (R&R Taphouse). On my trip earlier this year I ate at A Minute By Tuk, which has mix of local and international dishes. The food was nice, portions were a little small for Sri Lanka and given that’s its target market is tourists, it cost more than meals at a more local aimed restaurant. But if you sit outside on the balcony, you have a stunning view of the Ocean and coming from Australia, the meal still seemed cheap. 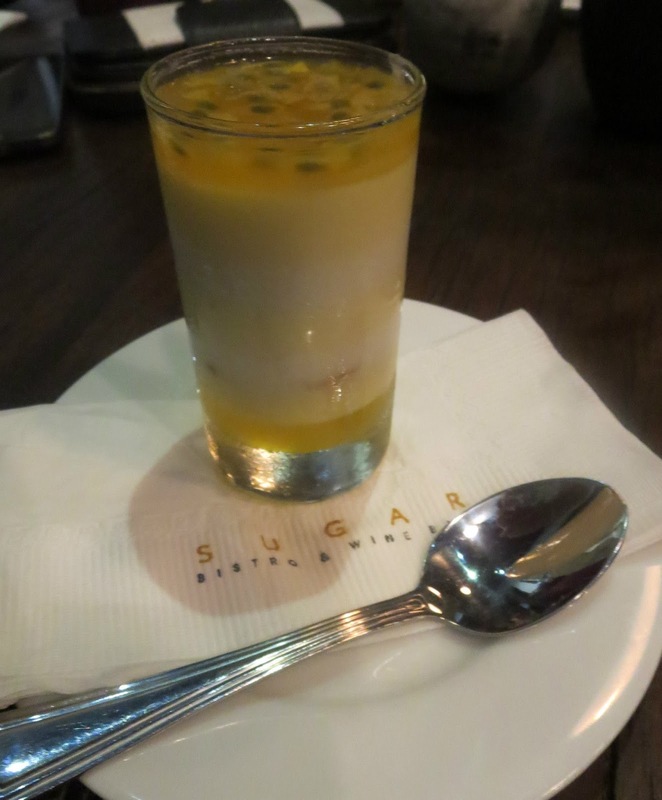 I also visited Sugar Bistro for dessert. Apparently, according to some family in Colombo, it’s supposed to be very popular but when we went we were their only customers. Again it was pricey here, and the desserts were tiny. My delicious mousse was served in a cup not much bigger than a standard shot glass. 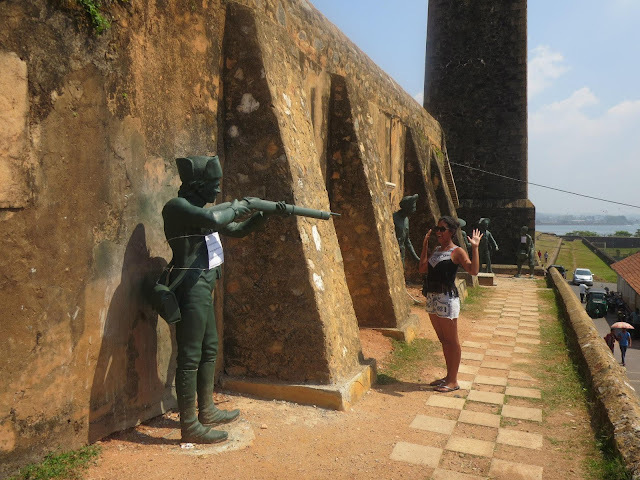 Certainly part of the original Galle, the Ramparts are enjoyed by locals and tourists alike. Sri Lankans from around the country come to enjoy and walk along the Ramparts taking in the views of the ocean (particularly nice around sunset). In the past year, a few new statues have been placed around which are fun to take pictures with (see above!) but are not really an attraction by itself. The ramparts are a nice place to sit, relax and eat an ice cream (my newest addiction when I’m in Fort is Pineapple Gelato from Pedlar’s Inn Gelato. So good although its costs the same as getting a scoop of gelato in Australia so quite pricey for Sri Lanka) or some local fruit. I mentioned earlier in the post, that I have fun memories of riding bikes on the then dirt roads of Galle. Although the roads may be paved now, hoping on a bike is a nice (and healthy!) 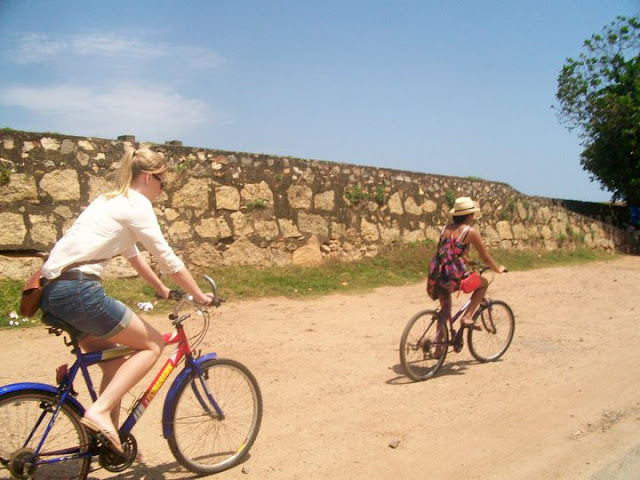 way of exploring Galle. Plus, if you ride at a nice part of the day it’s really relaxing feeling the air push past you as you cycle along. When I went earlier this year, I rented bikes from Pedlar’s Inn Hostel (promise I have no affiliation with Pedlar’s!) for 100 rupees for an hour. Oh Dani, this is great! I'm considering a food tour of Sri Lanka later in the year and this is making me want to go even more. I live visiting places full of history - this place looks lovely. Tourism is a blessing and curse I think. I often lament telling anyone about little hidden treasures for fear of tourism ruining a good thing. But it is usually good for the businesses. I think it is great that you get to keep going back and can watch the town grow and change.